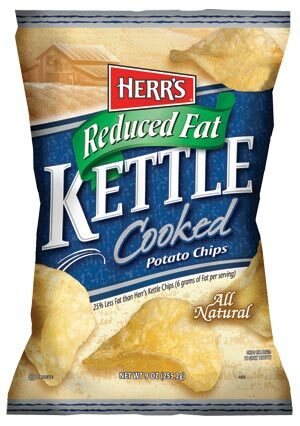 This is the same as the All Natural bag design except for the Chips, that are always seen at the foot of Herr's Kettle range, are now floating on their Reduced Fat air - very clever. The sepia toned historical reference reminds customers how long Herr's have been doing what they do. The colors go well together. A very striking design. Thin for a Kettle Chip, these had a crispy crunch rather than the hard, firm crunch often found with this form of cooking and thickness of Chip. They appeared to lack a little rigidity. These may have been a little lighter in color than the regular Kettle Chips that this variety is based upon. There were lots of oil bubbles, many of which were broken. The Chips were mostly small in shape with potato skin visible and lots of bent over or irregularly shaped Chips. It is easy to lose track of how many potato flavored Chips Herr's produces. Their balance of salt and oil, plus obviously their deals with major supermarkets etc., must be how they can make a profit off so many slight variations on what is a fairly bland theme. These are basically a reduction of 0.5g of saturated fat to their regular Chips. There is therefore no discernible difference.